I recently had the welcome surprise of finding an invite to a Catalyst webinar in my Inbox. It was with great anticipation and a touch of nostalgia for my Localisation Engineering days, that I clicked on the link and joined the meeting to discover what Alchemy had been up to. I soon realised that a practical user’s guide would be the best way to cover this on Localization, Localisation. The Alchemy Software Development website already lists What’s New in this release so rather than analysing the differences between Catalyst 8, for which we did a complete Launch coverage and Catalyst 9, I’ve put together a step by step tour based on the demo. This article can be used by Localisation Engineers and Translators alike to preview the Catalyst 9 interface using the 30 or so screen shots included (see after the slideshow for full screen versions), and also to read through some recommended processes and tips, adding to my past article on the Leverage and Update Experts. 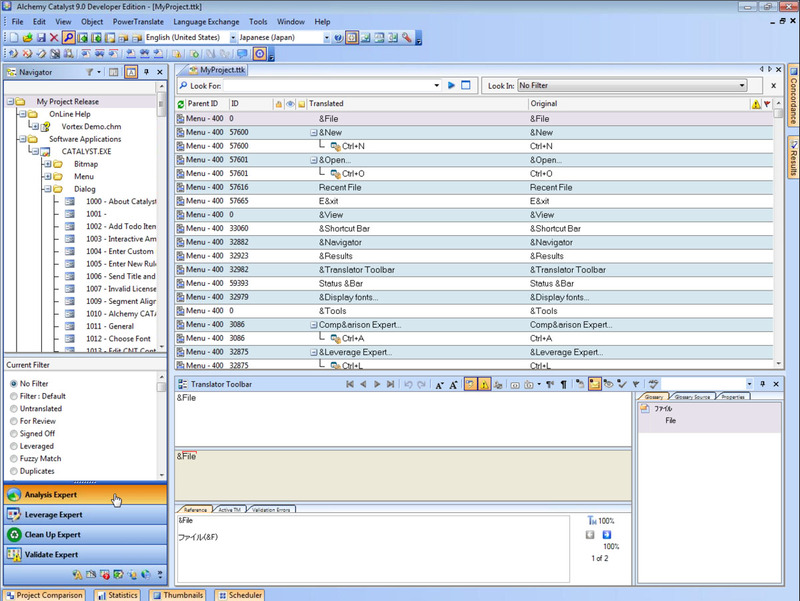 The User Interface remains the flexible and now very familiar .net window, with its various docked panels and tabs. It’s also a stable interface which will cause little or no navigation headache to even the most novice user. The first operation when getting started with Catalyst is to create a Project file, or TTK file. This is easily done by using the File – New menu and following the basic steps. You will notice in the screen shots that the example used includes varied sample files such as compiled help (.chm) not requiring any source or project files, and wpf executable. After the creation of the TTK, source files can be inserted either using the Insert Menu item or a context menu in the Navigator tab. Folder structures can also easily be used. Once the files have been inserted into the TTK, it is time to prepare it for leveraging. This operation of consists mostly of locking non-translatable strings and sub strings. It can be tedious on a brand new Project but the work done can be completely leveraged to the various language TTKs as well as any future versions of the project. The lock keywords functionality has been improved in Catalyst 9: the txt file which the project’s keywords list is now automatically generated in the background as soon as the user locks a keyword. Once a keywords list has been created, it can in turn be used to automatically lock the listed keywords in the remainder of the project. Another thing to note is that Maximum String Length can now be set on a batch of strings at once. Alchemy Translation Memory is a new proprietary format used to create Master TMs from completed TTK projects. This format allows to store Catalyst-specific context information such as the context (Dialog box ID, Menu Item etc. ), which can later improve the quality of leveraging by providing Perfect match. In Catalyst terms, a Perfect Match is a 100% match located in the same Dialog, Menu etc). Alchemy Publisher, Wordfast Pro, Trados 2007 or the nonproprietary TMS are also present provide compatibility with other TM format Catalyst might have to coexist with. Noticeably, Trados Studio 2009 TMs (.sdltm) still do not appear to be supported. The process recommended by Alchemy is to create an English to English Master TTK and then to automate its duplication and pre translation for each target language in the Project. With Catalyst 7, engineers had to manually duplicate TTKs. Catalyst 8 was a bit more helpful and created Project folders for target languages and project resources. In Catalyst 9.0 however, the Job file and Scheduler take care of a lot of the repetitive tasks associated with preparing a new Project. 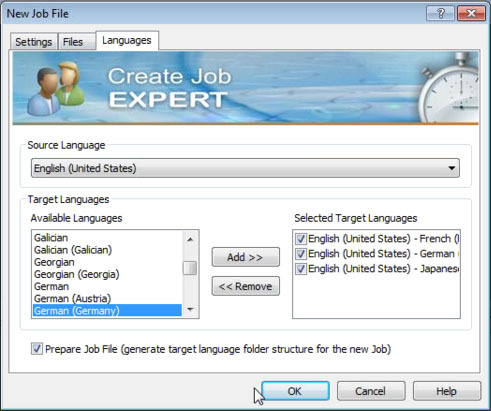 The Create Job Expert lets you use the Master TTK as a template to create project folder structure and corresponding target language TTKs. Meanwhile, such tasks can also be added to the Scheduler. This new queuing system allows the user to start working on the next project while it processes queued tasks in the background. The Command line automation has been improved since Catalyst 8 to include Analysis. The complete Catalyst localisation process can now be automated. Catalyst 9.0 Developer Edition also includes the Comm API which lets advanced users script TTK operations all the way down to string level, and output automation reports in txt or xml format. 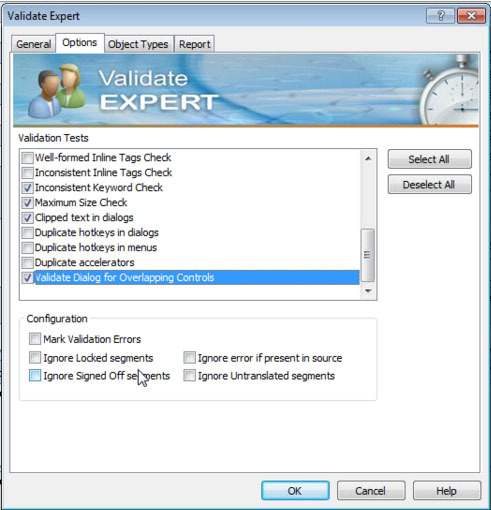 Validation still takes two forms: the Expert can be run to perform global check, and inline validation can also be switched as a non-intrusive real-time quality control. If a potential error is found, a flag will be raised through the bottom pane, but Translators will not be interrupted. They can simply go back to the issue by clicking on the notification once they are ready to attend to it. The Thumbnail view seems to be a great tool for engineers regressing bug. It gives a preview of all dialogs in a TTK and lets you click the one which matches for example the screen shot in a QA report and brings you automatically to the location of this dialog in the ttk file. The Concordance search and Translator toolbar do not appear to have been changed. Both were introduced with Catalyst 8 where there was strong focus on improving the user experience from the Translator’s point of view, and they seem to have delivered. The new Re-cycle button is a result of the same ambition. New translations can be propagated to entire project by using the current project as an inline TM in the background. Layouts are not recycled but fuzzies are supported. Finally the Clean up Expert has also receive some improvements. Like for all Experts, it is recommended to close the Project file before running it, and then select the file(s) to process from the Expert’s General tab. Clean up now creates a postproject.tm Translation Memory and generate supplied assemblies for .net. in my opinion, this new generation of Catalyst still offers a great solution for visual localisation. Although the differences with Catalyst 8 may not may not make a bullet proof case for immediate upgrade, the 25% discount currently on offer does represent decent value. Have you, like me, been slow to adopt Synergy? Do you maybe find it a little cumbersome or incomplete? Would you rather just open Workbench and TagEditor and get on with it? Or perhaps do you (or your clients) still find it easier to use Trados in conjunction with Microsoft Words? Well, this may be about to change! 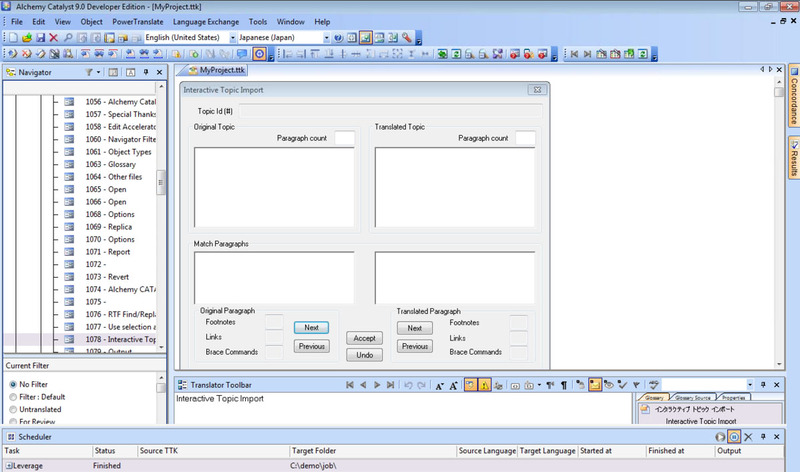 Earlier today, SDL conducted one of their very informative Webex meetings to announce a new version of Trados: SDL Trados Studio 2009. 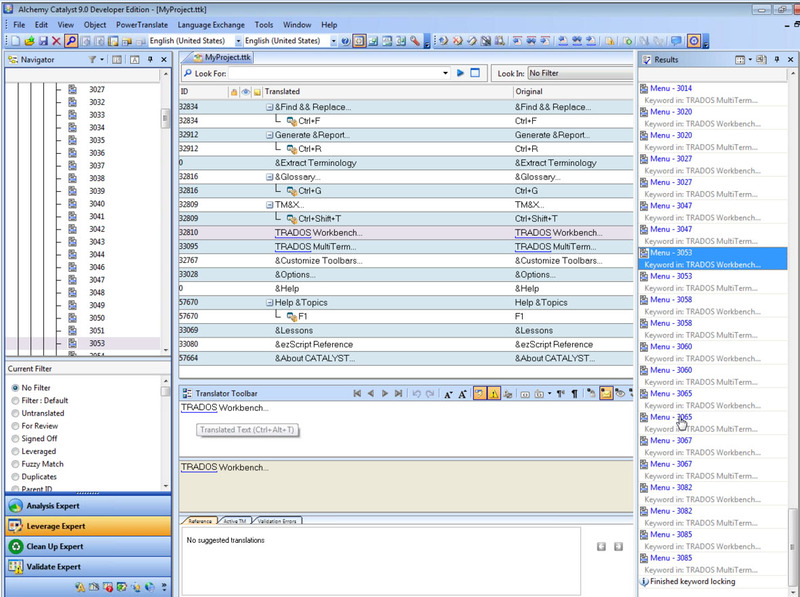 The release is due in June 2009, although “Trados 2009” is still in the last stages of development, so some of the features might yet change slightly. This is actually quiet attractive and the reason why I brought up Synergy above. SDL seem to have come up with a truly integrated environment for editing, reviewing, terminology management, project management and all the aspects of Trados related work. No need to open a TM in Workbench, load a TermBase, open a TTX in TagEditor, a document in Word, or turn the coffee machine on. New TM engine: the xml-based RevleX™. Among other things, it revives contextual match by liberating it from comparing old and new TTX files. Context Match works live, within any new document, and between files within a project. AutoPropagation™ immediately translates repeated strings within a document once you have translated the first occurrence. Searches can easily be run on both source and target segments. Multiple TMs lookup is available. AutoSuggest™: predictive text which leverages phrases rather than only segments from your TM as you type. Real-Time Preview: check final look as you translate, without navigating to a different tab. This seems very good news for those translators who find Trados tends to disconnect sentences from the whole document and lead translated documents to become a collection of sentences rather than a wholesome piece of work. 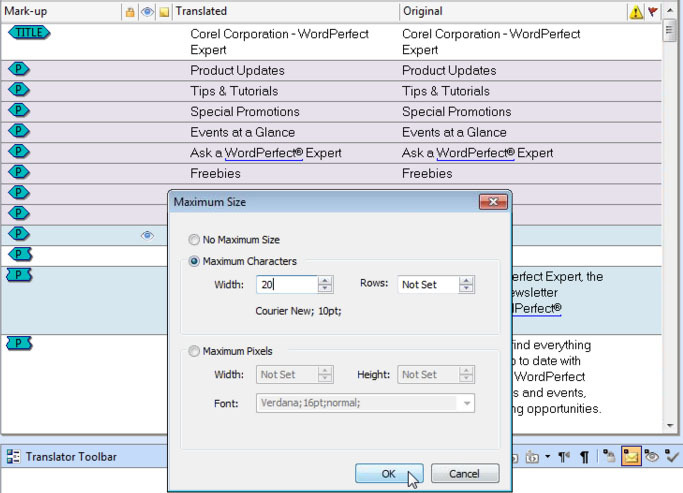 QuickPlace™: improves text formatting, tags, placeables, variables management by providing it in-line. DTP application support has been updated and PDF can now be edited directly. New XLIFF-based default format for bilingual files (.sdlxliff). Yes, this does mean the end of TTX files! Improved TMX and TBX support. Easy access to API for 3rd party applications. As I mentioned before, SDL Trados Studio 2009 builds on Synergy. The interface has the now familiar Visual Studio .net feel which we’ve seen in Synergy as well as other CAT tools. From the point of view of a Trados user, as in a Workbench + TagEditor user, the integrated aspect really becomes more prominent and inevitable, but in a good way! Start: provides the general overview. Projects: has new project status and Task History panels. Files: navigation pane has My Tasks and Sent Tasks folders to promote standardised filing. 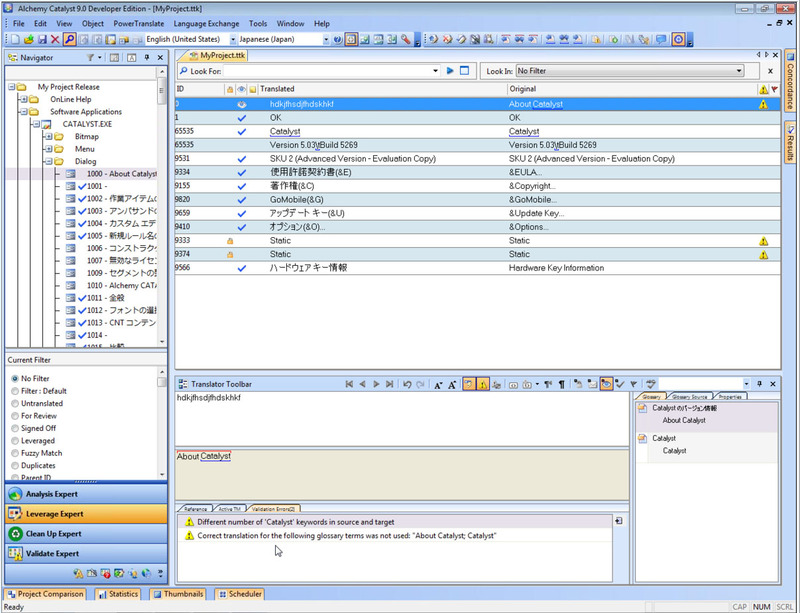 Editor: contains the entire interactive translation environment (more in the dedicated section below). TMs: preview, maintenance, update string, search from within the Trados Studio UI. A document can be opened from the main UI by simply clicking Open Document. But there is also a Windows Explorer context menu shortcut, which seems very efficient compared to opening Workbench, then TagEditor like you would most likely do with your current version of Trados. The Editor panel now has TM + Bilingual file+ TermBase + Previews all open at once. Source and target segments appear in a very clear and tag-free left-right panel view. This immediately seemed much more welcoming than TagEditor. Context Matches are flagged with a CM icon – not dependant on having a matching old ttx, also works live within new documents. Formatting can still be copied from source to target. Placeable and terms are offered in context (drop down like predictive text). No need to use arrow icons at the top of the UI (keyboard shortcuts still work). AutoPropagate seamlessly pre-translates further occurrences of strings you have just translated. They are marked as Unconfirmed 100% (orange instead of green). Full terminology functionality is also integrated, including adding to termbase. A Review mode allows to filter by match type (e.g. display only Unconfirmed 100% matches within a document for batch review and sign off). Editor can edit PDFs (but deliverable output isn’t PDF). 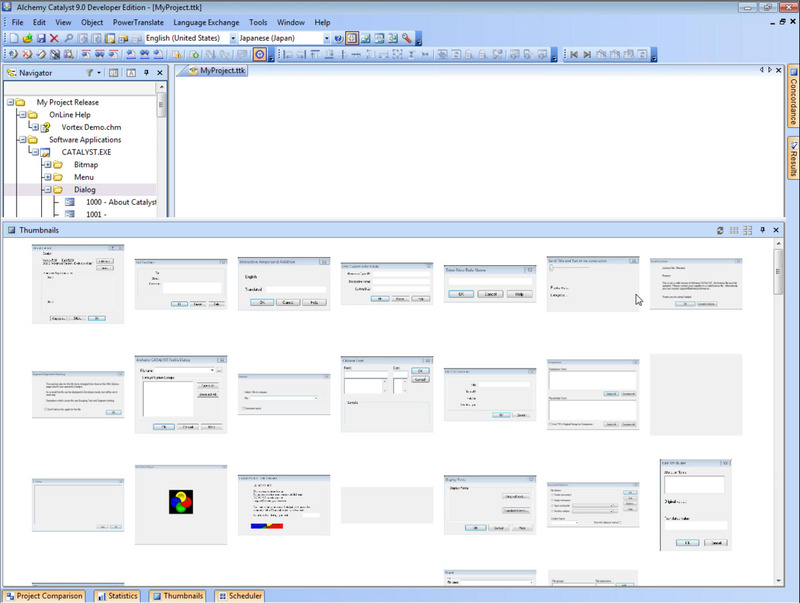 Project templates can be saved with a high level of customisation. QA Checker is now in version 3.0. TM options can be edited from here. Dictionaries for AutoSuggest can be added. 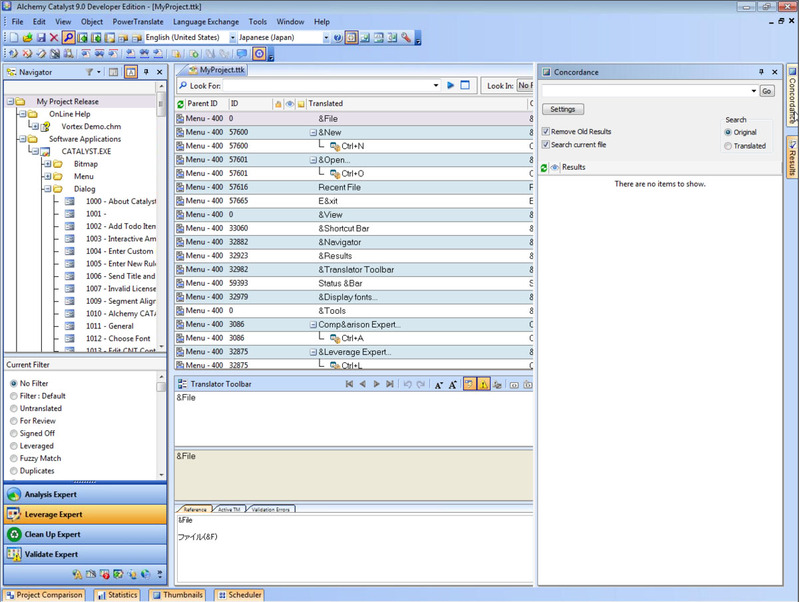 Tasks can be assigned to users during project creation. This information is then included when packages (i.e. translation kits) are created. Files can be merged, which creates a single .sdlxliff file out of potentially several file types. Can include Main (or Master) TM. Can include an existing Project TM in a main package or create separate Project TMs if multiple packages (.sdlppx) are distributed. Can link-up with Outlook to send automatically populated Handoffs emails. Can search through source and target.